The first is Ecuador Esmeraldas 2017/18 Direct Trade. Wild Harvest Bolivia is in. Have you heard about those new fancy meal services like Blue apron that delivers pre-portioned ingredients right to your door every week or month and you just have to follow the recipe and cook it up for a fresh meal? Well, this is Chocolate Alchemy's version. I have put together everything you need (minus the Melanger) to make chocolate on a monthly basis and get your fix of fresh homemade chocolate! Roasted cocoa nibs, sugar, and other ingredients as needed - all weighed out and ready to go. And it is Subscription based (that's the club part) so you only need to order once and it shows up until you decide to stop it. There are lots of details so check them out. In addition, since we brought the software online to offer Subscriptions, you can now get a steady supply ofBrewing cocoa at whatever frequency you desire....with a discount for subscribing. What do you think? Is there anything else you want to to show up to your door every week or month? That goes doubly true for an issues you find. It's new software after all. The last day we will be shipping is Friday December 23. And hopefully if you need anything by that Sunday (December 25 – Christmas) you will have ordered well in advance. Today is just a small laundry list of announcements, some of which I would like your opinions on. There is no Ask the Alchemist because my queue is empty. Fiji - a new Direct trade origin. Let’s start off with saying this bean ranks in my top 10 favorites ever. It has virtually everything I love about chocolate rolled into one. 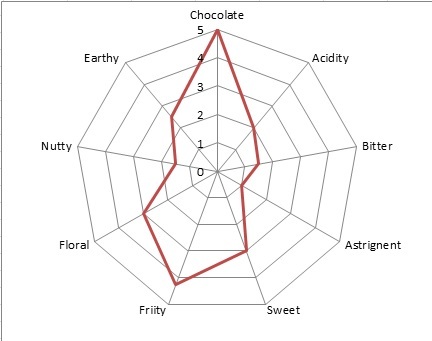 Just look how it pegs the chocolate category in the spider graph! And sweet. And fruity. And nutty. The flavors just keep coming and coming. A very limited supply of Belize from Maya Mountain has arrived. 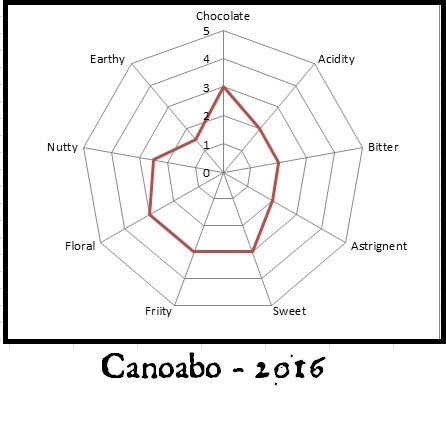 Belize 2016 Organic/Direct Trade: Smooth, silky chocolate. The raw beans have an odor of fresh pineapple. While roasting there is toasted macadamia nuts, warm proofing spelt bread and a lovely savory quality with a touch of tang from fermentation. The four *new* old favorites from Venezuela are also here. Sur del Lago, Cuyagua, Guaniamo and Canoabo. 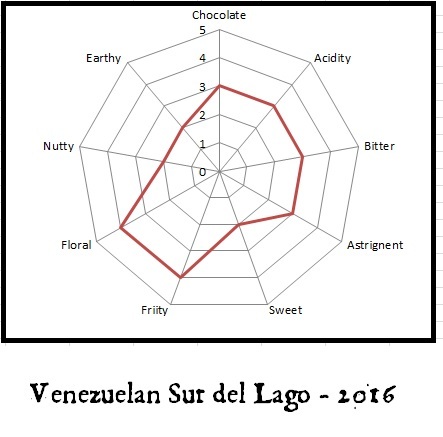 Sur del Lago 2016 - It is a complex, well-rounded cocoa that can make a luscious chocolate bursting with flavor accented by bold red berry fruit, dry cashew, toffee, malt, caramel and most important, chocolate. 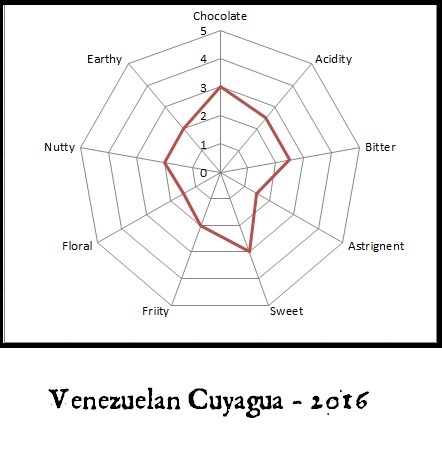 Cuyagua 2016 This is what Criollo is all about and what everyone claims to have (but rarely do). It is fruity, delicate, with walnut and plum skin. The aroma is plum and vanilla, with both coming through in the taste along with a nice back drop of current, vanilla and cream. 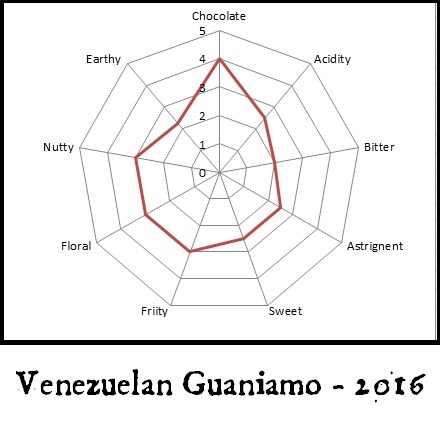 Guaniamo 2016 This is a wild harvest Forastero and the most elegant I've ever tasted. Actually, very atypical for a Forastero. That's what natural selection can get you. There is rose and gardenia in the nose. The flavor is distinctly chocolate with undercurrents of loam and soft leather. It is rather low in bitterness but has a nice balancing astringency, but not overpowering. There is distinct acidty, but soft like a malic acid grape nip. The lasting impression is succulent. Canoabo 2016. What it is is a study in balance and elegance. Like a lot of the beans in this region, there is cream and soft red fruits. Red currant comes to mind. There slight tang of mineral molasses for balance. A touch of roasted brazil rounds out the flavor. I'm not quite sure why spambots have it in for us currently, but we are being hit hard and barely keeping our head above water. When we don't keep up, you are going to see the main site lag pretty bad and not load. We are working on it. This is just so you know we know.